New study finds sea levels rising only 7 in. per century – with no acceleration | Watts Up With That? So which rate is closest to the truth? In a study designed to answer this question, Jevrejeva et al. 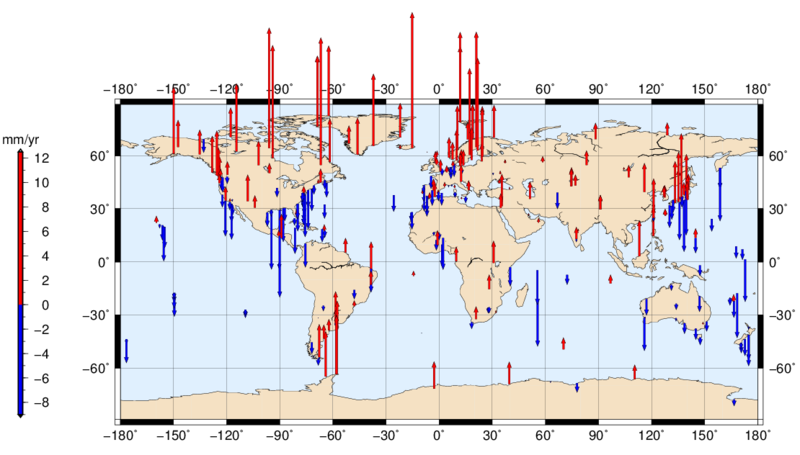 (2014) say they “renew the global sea level [GSL] reconstruction by Jevrejeva et al. (2006), using monthly mean sea level data collected by the Permanent Service for Mean Sea Level (PSMSL) covering the observations from 1807 to 2010,” thereby improving the GSL reconstruction by increasing data coverage “by using many more stations, particularly in the polar regions, and recently processed historic data series from isolated island stations,” as well as by extending the end of the reconstruction from 2002 to 2009. Trends and acceleration in global and regional sea levels since 1807. Global and Planetary Change 113: 11-22. Jevrejeva, S., Moore, J.C., Grinsted, A., Matthews, A.P. and Spada, G. 2014. We use 1277 tide gauge records since 1807 to provide an improved global sea level reconstruction and analyse the evolution of sea level trend and acceleration. In particular we use new data from the polar regions and remote islands to improve data coverage and extend the reconstruction to 2009. There is a good agreement between the rate of sea level rise (3.2 ± 0.4 mm·yr− 1) calculated from satellite altimetry and the rate of 3.1 ± 0.6 mm·yr− 1 from tide gauge based reconstruction for the overlapping time period (1993–2009). The new reconstruction suggests a linear trend of 1.9 ± 0.3 mm·yr− 1 during the 20th century, with 1.8 ± 0.5 mm·yr− 1 since 1970. Regional linear trends for 14 ocean basins since 1970 show the fastest sea level rise for the Antarctica (4.1 ± 0.8 mm·yr− 1) and Arctic (3.6 ± 0.3 mm·yr− 1). Choice of GIA correction is critical in the trends for the local and regional sea levels, introducing up to 8 mm·yr− 1 uncertainties for individual tide gauge records, up to 2 mm·yr− 1 for regional curves and up to 0.3–0.6 mm·yr− 1 in global sea level reconstruction. We calculate an acceleration of 0.02 ± 0.01 mm·yr− 2 in global sea level (1807–2009). In comparison the steric component of sea level shows an acceleration of 0.006 mm·yr− 2 and mass loss of glaciers accelerates at 0.003 mm·yr− 2 over 200 year long time series. May 20, 2014 in Sea level. Is there any way to tell in which areas the coast and sea bed dropped, accounting for these changes? now. And scrap those plans for relocating LAX. This is going to raise h*ll with the alarmists… Bummer! and look up the data from March 27 2004 (#version_2004_rel1.2) and do an analysis you will find that in 2004 the rate of sea level rise for 1992.928 – 2003.842 was 2.6 mm/yr. Today (#version_2014_rel3) you will find that the rate of sea level rise for that same time series 1992.96 – 2003.819 is 3.5 mm/yr. A change of nearly a millimeter per year. The historical data has been rewritten. I plan to make a page that will let you analyze rates between different versions of their dataset over the same time period of data, I just haven’t gotten around to it yet. From what I understand about things like the viscosity of water & gravity, the actual rate of sea-level rise can’t vary between locations on any long-term basis. Now, you do have things like isostatic rebound & subsidence, but those should tend to average out over a large enough number of tide gauges. That is, unless the Earth itself is changing size. 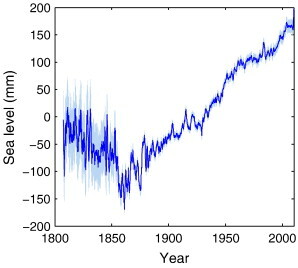 The paper does quote an acceleration, but for the period 1807-to 2009, which seems an odd period to quote as we’d be most interested in whether or not anthropogenic emissions had caused an acceleration in sea level rise. Comparing 1900-1950 and 1950-2009 would seem sufficient. They are error ! and the papers are dog-s[..]t (a lower and more disgusting form of Bulls[..]t) ! The underlying assumption is that the basin is a fixed size, which is preposterous. There are 15,000 volcanoes in the oceans. Tectonic plates are sliding all over the place. Rivers dump mountains of sediments into the seas. MSL is a concept, not a value. Tide gauges without GPS for tectonic uplift/subsidence can say nothing on average. And GPS without local correction is not designed to be this accurate. And the rates found here disagree with the NASA sat altimetry data that everybody else uses. Just wrote for the next book about that. All of which just proves the uncertainty monster is alive, well, large, and very scary. They also point out that the choice of glacial isostatic adjustment datasets make a difference in the estimates and that better estimates are needed, especially in the Arctic and Antarctic. I wish I could find the letter from BOM some years ago. They stated that sea levels would rise 177MM by 2050. It could have been 2100 for all I can remember. So where is the panic. Land does sometime sink, not much. Well done those people? Figure 3 seems to show a leveling off in the past ten years or so (!). Bush Bunny, a number of recent SL studies show a deceleration in SLR and the current rise is about 177mm or about 7 inches by 2100. ZIP difference to the 20th century.. And the 2014 Leclercque et al world glacier study shows that glacier retreat has slowed since 1950 or exactly the opposite to CAGW theory. IOW there’s ZIP evidence to show for CAGW at all. I very much like that the seal level rise estimated in this study very closely matches the SF tide gage rate of 1.92 mm/yr since 1897. The NOAA data for SF also shows no discernible acceleration over time and the last 10+ years look look a decrease in rate (could be flat or dropping). Neville yes I know, this letter, that I can’t find, but it wasn’t destroyed, is millimetres less than CM. I seem to have found deaf ears with Tony Windsor stating this fact. He wiped me off years ago and I was once one of his staunch supporters and workers. I have been searching for a sea level rise at the end of the 20th century that would reconcile the 20th century’s average rise rate of 1.8mm/year with the satellite era average of about 3mm/year. In 2011 I emailed Xiaoiong Wu from JPL about this hypothesis and what had become known recently. The main exchange is below. There are features beyond satellite measurement range, such as the precise size and shape of ocean floors, that are not yet known well enough to enter into the complete solution of the sea level rise equations. There are features like the East Pacific Bulge whose size is enough to change surface sea levels with little movement of its own, but I’m not sure that there are any estimates of how fast it is changing – if it is. There are other known unknowns like the heat input from hydrothermal vents, again poorly characterised. In summary, so little is known abut the deeper 50% of the oceans and their floors that it is dangerous science to state very much at all about mechanisms affecting sea level change. That’s even without the unknown unknowns that can pop up when study gets more intensive. However, Prof Lu’s response was about surface measurements. Sorry for the (condensed) length. I know of nobody that has produced or performed an independent study like what we did. Previous attempts have been blurred by the presence of several geophysical processes that are known to exist, such as GIA and the fact that the geodetic network is not evenly or densely distributed. On the question of G, you are right that we have not analyzed it. But several papers from Lunar laser ranging and Mars tracking data have clearly shown that G is a constant to the relative precision of 1X10^(-13)/year. This number is too small to be significant when compared with measurement precisions. So, G is really a constant. 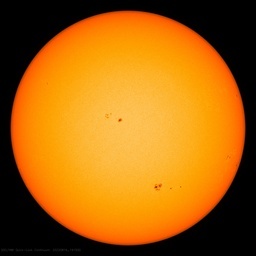 And these measurements are much less affected by any possible expansion of the solid Earth. Also, if you look at the scale difference between VLBI (very long baseline interferometry, which is not subject to the influence of the GM) and satellite laser ranging, there is no evidence of variability of G at the level of 0.16 mm/yr level. I agree that the geological processes are very hard to quantify. That is why we approached the problem with a neutral point of view. But again, in the satellite analyses, GM has been considered constant. It is very hard to believe that the Earth’s mass is changing. Thank you for the paper and your reply. As noted, I have no firm position on whether the Earth is, or has been, expanding. However, I have had the experience of long personal discussions with the most advanced thinking available on the subject at the time, in the 1970- 1990s. (Prof Carey passed away in 2002). The single question that I have is: Has anyone close to you performed a clean-sheet analysis of satellite positioning with a prime aim of looking for evidence? It is possible that your impressive refinement of orbital numbers has proceeded with no direct thought that G or g might be variable because you have not examined it as a prime possibility, but as an incidental effect. I doubt that this would happen at your level, but the circular logic problem can be devilish. Thank you for your interest in our published research. For your information, I am attaching a pdf version of our paper. While I cannot speak for all JPL scientists, so far I have not heard any objections from them on this paper. But in science, it always takes time for people to scrutinize previous research and build consensus gradually. We don’t have much assumptions in this particular paper on geology. However, most of the geodetic (satellite) data have been processed by several centers assuming the gravitational constant G is constant. That assumption is supported by overwhelming evidence from Mars tracking and lunar laser ranging. Currently, the estimated dG/dt is around 1X10^(-13) G per year. This number is smaller than the measurement uncertainties and not significantly different from 0. As a scientist, I would not call our result in stone. It is the most recent confirmation that the solid Earth is not expanding beyond our measurement accuracy using a rather comprehensive method. Sorry, typo, should be Xiaoping not Xiaoiong. What they do find is that acceleration varies over time. It was negative from about 1950 to 1975, and positive from about 1980 to 1995 (Fig 15). Since then it is patchy, but of course the periods available to fit a quadratic are smaller, with noisy results. One can see from fig 3 why 1850 is such a convenient date to begin climate science, for the warmists. oh, c’mon! Everyone knows that sea level rise is wildly out of control….. only cranks would deny it! p.s. Did you know that the whole UNFCCC => IPCC process was launched, via activist scientists at WMO and UNEP workshops, claiming that SLR should now be somewhere between 5.5 cm and 24 cm per DECADE?? (closer to 24 cm based upon humanity’s rather tepid response to demands to slash emissions etc.). Is this another example of the observations say this and the models say that, so the observations are wrong? I am obviously speaking from the alarmist point of view. based upon humanity’s failure to do much under the instruction of our betters, we ought to be approaching the higher rate of 24 cm per decade of SLR anytime now….. that is what the IPCC was created to forestall !! btw, speaking of activist scientists, Peter Gleick is listed as one of the 1987 workshop participants! I would not recommend using the Peltier GIA. The ICE-5G model is known to be grossly inaccurate, particularly in Antarctica. And this by the way is pretty conclusive proof that there has been no major decrease in the amount of ice on Greenland or Antarctica. When an ice-cap is losing mass sea level will go down in the vicinity, both because land will be raising because of the decreased load of ice, and because the gravitational attraction of the ice-mass pulls up the sea-level around the icecap. The latter effect is surprisingly strong and means e. g. that even a complete melting of the Greenland ice-cap would have little effect on the relative sea-level in northern Europe. As I understand this, on average sea levels have accelerated 0.02+/- 0.01mm year over 202 years or 4.04mm in total added to global sea levels. I for one is not losing any sleep over that. Bearing in mind the uncertainty over measurements even today this figure is probably no better than a guess. Like in all other measurements underpinning CAGW there is no dangerous acceleration to be found anywhere. No, it is .02 mm/yr/yr, A rise of 4.0 mm/yr in the rate. Yes, but 1807 is not a very interesting date. There is no acceleration (by “eye-meter”) since 1860. Good man! Any idea if we can access with/without inv. barometer frig as well? Nice work Dave. I had a quick hunt and did not find it. I should have looked here first. WUWT is more use than Google! Nick, how can that match up with the paper’s figure of a current rate of rise of 1.9 mm/yr? Almost uniform sea level rise since 1850 with recent slight deceleration – as RGB recently put it, “comes dangerously close to falsifying the whole CAGW hypothesis”. They can’t claim accelerating ice loss and missing heat hiding in the sea with ZERO signal from sea level rise. No the paper doesn’t say that. It says the rise 1993-2009 is 3.1 mm/yr. They get acceleration by fitting a quadratic. There are examples in their Fig 16. The initial slope is negative, and the final slope exceeds 3.1 mm/yr. Jevrejava is by no means a GW sceptic to read some of her comments, but I do think that she is a serious scientist. I have been waiting years for her to update here 2006 paper which had a data cut-off in 2002. This is a very detailed paper and will take some time to digest. this will give a positive “acceleration” that is probably not representative of what is really happening. The regional breakdown is very interesting and requires more inspection. NE Pacific and NE Atlantic are nearly flat and NW or each ocean are amount the steepest gains. Also lesser increase in southern Atlantic and Pacific. Large water mass , less warming? Certainly plenty to chew on here. Looks like the most thorough and detailed study of sea levels to date. Though surely not with some faults, it looks very informative. See fig 11 showing that some of the “acceleration” is due to GAIA adjustments. ( In theory glacial rebound can not be accelerating. This means there is a problem somewhere). It’s flat before 1850, goes to an increase of about 0.5 mm/yr during 1850-2000. That’s a fairly sharp acceleration around 1880. Seems fairly const rate of change since 1900. Perhaps someone ought to fit a quadratic to that too. It should be remembered that GAIA adjusted sea rise may help calculations but are irrelevant to what matters to populations in coastal areas which most of the scare-mongering and wild claims are based on. No-one gets flooded out by an “corrected” sea level , it’s wet kind of sea level that matters. I think that’s what is often referred to as not “statistically significant”. They don’t give any error estimation for the 1880-2009 “acceleration” of 0.001 mm·yr^2 but it is clearly it is not significant. They seem to make a bit too much of this “finding” but at least they are thorough and above board. The data is presented with all the warts for anyone who wants to see how they got there. In theory it isn’t. The left side of Fig 10 shows that. The right side shows how that is affected by data gaps (I’m not sure why). I think Fig 11 reflects that. ie in 100 years time sea level (may be) rising 10 mm / century faster than it is now. I don’t think even Bangladesh need to worry about the “acceleration”. Indeed if we look at their figure 7 the tide gauge record shows NO change in sea level since about 2003. This seems to reflect the temperature “hiatus”. This is in contrast to the politically correct satellite record. Whatever way you dice it the effect is clearly shown in figure 7 and the figures stand. A notable part of the supposed acceleration comes from a GAIA adjustment that should not cause any acceleration. If this is due to changes in data length, the whole idea of including that early part and fitting a quadratic becomes very dubious. 0.001 mm/yr^2 +/- ??? means NO acceleration. There is a good agreement between the rate of sea level rise (3.2 ± 0.4 mm·yr− 1) calculated from satellite altimetry and the rate of 3.1 ± 0.6 mm·yr− 1 from tide gauge based reconstruction for the overlapping time period (1993–2009). The new reconstruction suggests a linear trend of 1.9 ± 0.3 mm·yr− 1 during the 20th century, with 1.8 ± 0.5 mm·yr− 1 since 1970. Maybe I need more coffee. I’ve read this about six times and it seems to say 3.3 ~= 3.2 ~= 1.9 ~= 1.8 where “~=” denotes “approximately equal”. Reads sort of like a computer mistranslation of some oriental language into English. Usually there is some clue that tells me what I’m misreading. but this one utterly defeats me. Can anyone help out? Jevrejava seems to have some fairly strong warmist tendencies in her comments however she seems very capable of divorcing this from her scientific work. We all have opinions, her ability to remain objective in her work is a refreshing change in this field. After this mysterious “acceleration” concentrated around 1880, there is a very constant rise and NO acceleration. No, it isn’t constant rise. That’s best shown in their Fig 15. There are periods of positive and negative acceleration that balance. Don K: Usually there is some clue that tells me what I’m misreading. but this one utterly defeats me. Can anyone help out? Pay more attention to what you are reading: note the periods to which these different figures apply. Indeed it is a ‘climate index’ that is misnamed Global mean sea level. It has less and less to do with the wet type of sea level with each passing year. Except, they don’t put that on the front page, You have to dig down in links about description of data etc. It’s also “barmometer adjusted”. Just how air pressure is supposed to affect the global mean is not explained. Enquiries are ignored. Is that the American Standard inches? Or the new alarmist inches? Hard to keep up with changing metrics by alarmists. “Quoting the five researchers, “the new reconstruction suggests a linear trend of 1.9 ± 0.3 mm/yr [7.5 inches per century] during the 20th century” and “1.8 ± 0.5 mm/yr [7 inches per century] for the period 1970-2008.” That seems not terribly consistent with “(3.2 ± 0.4 mm·yr− 1) calculated from satellite altimetry and the rate of 3.1 ± 0.6 mm·yr− 1 from tide gauge based reconstruction for the overlapping time period (1993–2009)” … unless sea level rise was very low from 1970 to 1993 and very high thereafter. I suspect that the problem is that I’m comparing stuff that isn’t readily comparable. But I’m not quite sure how. I’ll come back and look at it again in a few days. Maybe it’ll come together then. The link to the full paper above is not working, but here is another link to the full paper. I do not think any of the acceleration rates quoted here are valid. The sea level rate since 1870 or, since 1930 when global coverage became large enough, is a roughly a “linear trend”. Jevrejeva did a simple quadratic equation going back to 1807 which should not be thought of as robust (more likely it was just trying to keep in the good books of the climate science bullies). It looks more likely that sea level from the gauges have been rising at 1.8 mm/yr (with a few times when it goes off-trend like in the 1960s, higher, and especially the early 1990s, lower. The satellite trend starts in 1993. This was a very low point in sea level most likely due to the cooling from the Pinatubo volcano. The data will likely become available soon. The comments above the Peltier’s ICE-5G glacial isostatic rebound model which has sea depth decreasing at 0.3 mms/year takes a slight beating in the paper. GPS is producing quite different results in different places (although the global rate is probably close). Fitting a quadratic to estimate an overall “acceleration” seems highly questionable. There is clearly a very punctual change in direction around 1860. There is a roughly semi-sinusoidal variation with a base period of about 120y on top of an essentially linear rise since 1880. The periodic form looks about 30 years out of phase with changes in SST. This would suggest an integration process. Perhaps this reflects diffusion of SST into OHC with a slow time constant. It would be interesting to get the resulting time series in numbers as well as just the pics. Bill Innis: more likely it was just trying to keep in the good books of the climate science bullies. Yes, the quadratic fit is highly questionable and it looks a lot like orthodoxy compliance that this got into the abstract, rather than the real result of the study : 1.9mm/y for 20th c. with NO acceleration. As someone commented recently, it’s a bit like reading Soviet era PRAVDA. You get the govt. line and then try to read between the lines to find out what is really happening. I give Jevrejeva credit for very fully documenting this work. At least we have enough detail to read between the lines ( and ignore the abstract ). I’d guess that it is the individual measurements that are adjusted for barometric pressure, not the final number. Atmospheric pressure does significantly affect sea level (it’s higher when the pressure is low) I don’t recall exactly how much, but in the range of 30cm for very low pressure. Not that an additional foot of sea level rise is likely to concern observers all that much at the heart of a monster storm. Anyway, one of the things on my todo list is to look into where the pressures used to adjust sea level data come from. AFAIK, there are substantial areas of the planet with few or no barometers and I think that it is not currently possible to measure surface atmospheric pressure from a satellite. Indeed, which is why it makes no sense producing ib-adj global data . There used to be the option of no-ib but that is no longer available (at least to the public) and requests for a link to it do not even the get courtesy of a reply. C.U Bolder is (data) massage parlour now. Forget the satellite altimetry. That’s why I’m very glad to see an up-date from Jevrejeva. Much more informative. .02=2/100 or 20/1000 1/1000 of a mm,=1 micron or 1/1000000 meters 20 microns of acceleration per annum is not significant when we pump enough water for irrigation to account for 100 times that. 20 microns of acceleration per annum is not significant when we pump enough water for irrigation to account for 100 times that. 0.01 mm·yr^2 is probably indistinguishable from zero. (They forgot to give any error estimation for that). What is significant about this paper is that GHG forcing that is supposedly causing exponential, run-away warming, collapse of the polar ice sheets, retreat of the worlds glaciers, etc since around 1960 is not visible at all in the sea level record. All we see is the same natural variability that there was before 1960. … after 100 years, you get 11 inches of sea level rise. So, an acceleration rate this high would be an important number. Its just that it is probably just an artifact of the methodology used. One would need the actual annual sea level numbers produced by Jevrejeva 2014 to see if it is valid number. One can compare how sea level is changing each year in 3 recent reconstructions to see if it is valid (Jevrejeva 2008, Church and White 2011, Ray and Douglas 2011). Back to 1900, we could argue there is an acceleration rate ranging from 0.006 mms/year/year to 0.021 mms/year/year. But, you know, I still would say the values are not different than Zero. A constant 1.8 mms/year. If we just use the same reconstructions starting in 1960, now the acceleration rates bump up to 0.04 mms/year/year to 0.059 mms/year. Again, hard to tell if this is valid. It is an artefact as I suggested , due to the incomplete cycle. Here I have run a similar quad fit on a linear model with semi-sinusoidal bumps, like those of the Jevrejeva sea level record. I find it fits an “acceleration” about twice that found in the paper, as well as somewhat underestimating the linear component. This probably means that their insignificantly positive “acceleration” could in fact be an insignificant deceleration 😉 and their 1.9mm/yr 20th c. trend may be 2.0 mm/yr . It would require a actual data to do this accurately but I think I’m sufficiently close to establish the principal. Fitting to an incomplete bump like that would produce similar results. Since we don’t yet know how that last bump will shape up, their method is not wrong. but some appreciation of the fact they are fitting to data with an obvious cycle component and how the fitting period will affect this is important before anyone get too excited about 0.001 mm/yr^2 “acceleration” in sea levels. That little word of caution will of course be totally ignored by the media who will jump on the “catastrophic acceleration” of global sea levels “on the heels” the imminent “collapse” the entire Antarctic ice shelf, due in 200 years. The data will likely become available soon. Do you have a source for that data ? I was not aware that any of the Jevrejeva data was publicly available, even from the 2006 paper. The problem with “improving” the database by including a large number of long lived stations is the inherent bias toward sites that will be subject to long term subsidence. These sites weren’t originally selected because they were good locations for the monitoring of sea level change. They were selected because they were favorable for the construction of protected port facilities. As a result, they are more likely to have been located in a sheltered bay, inlet, or estuary underlain by relatively recent geologic deposits subject to natural and/or man-induced subsidence. As opposed to relatively more geologically stable sites on exposed rocky coastlines. I suppose. that is a convenient coincidence for these investigators. It doesn’t capture the data exactly (the s.d. is probably lower), but it should be close. It looks like the sea level rise has the usual 60-year AMO signal it, like everything else, so the “acceleration” from 1990 – present appears to be nothing more than an artifact of that. It’s becoming increasingly clear that most climate alarmism has derived from a failure to account for the AMO. This oscillation is also the explanation for Don K.’s confusion. Figure 3 shows the no/slow-growth period from 1960 – 1990, which offsets the fast growth after 1990. Thanks AJ, better than nothing but it looks rather approximative. I may have a look later. It looks like AJ Webplot Digitizer is good so we can now update with Jevrejeva’s 2014 data. Comparing Jevrejeva 2008 and 2014 annual sea level increase numbers – pretty close. Now I am most interested in is sea level accelerating? How does it compare to the satellite altimetry. So here is the 4 series from 1993 to 2009. The numbers are all over the place. Potentially decelerating. The average over the period could something like the satellite altimetry of 3.26 mms per year but this is semi-deceiving because the numbers were higher at the beginning. Now we’ll add in the satellite altimetry from 1960 to 2014 for a comparison. Its hard to say there is a real acceleration in this data. Some of the sea level reconstructions from tide gauges are available here. (If you want the updated Church and White 2011 data, you’ll have to download a zipped file from CSIRO linked on this page). We estimate an acceleration of 0.02 ± 0.01 mm·yr−2 in global sea level by the conventional method, defining the acceleration as the second derivative of sea level with time (twice the quadratic coefficient), measured in mm/yr^2. Really not sure if further fitting could be taken seriously without getting the real data. It’s going to be pretty close to the author’s results and no one is going to get any more accuracy unless they start with the correct data, not an approximate “webscan” of a graph in a pdf. It looks like there may be some interesting info in this dataset but I see no point doing any further d.p. unless I have the true data. If the authors report 0.001 +/- ??? fitting post 1860 with a rising half a cycle at the end, there’s probably -0.002 if you remove the cycle. It’s sod all either way. Call it linear. The question this raises in my mind is what happened around 1850-1870 that changed a down slope into a upward slope. It was pretty punctual on this scale of events. Turning it into a quadratic term applied to the full data range seems highly questionable. Looking at rate of change it’s been dropping since 1995 and just gone -ve since about 2003. Reminiscent of SST. Greg… I don’t disagree with you. The estimation process is probably offset by up to 0.5 years which usually won’t get you the peaks and valleys. IMHO, it’s probably ok for looking at trends over say 20yrs, but not if you were looking at year to year variability or say the correlation of ENSO with MSL. And I agree that we can call this reconstruction linear from 1900 onwards. Also, I don’t really have an opinion about the merits of any of these studies. Most look plausible to me, including the satellite reconstructions. Heck I even rolled my own for the NH from 1930 onwards which seemed fairly consistent with Jevrejeva, C&W, and the satellite data. The issue in this case is that majority of the tide gauges in the 1807 to 1870 period were in Europe and the north-east US. They were mostly in areas where post-glacial rebound was occurring so sea level was falling on average for these gauges. I have a chart using the PMSL database (1807 to 2009) and each point on here is an individual tide gauge’s change in sea level by year. You can see there are groups that are rising and groups that are falling and these various groups are post-glacial rebound/subsidence trends. ie. without going back and re-adjusting each gauge’s numbers for the current estimates of rebound/subsidence from the quite accurate (after at least 3 years of measurement) GPS stations, one cannot be sure what the real sea level change was until about 1930 when there was enough global coverage so that rebound/subsidence was no longer a net factor to the average. Thanks Bill, so it’s quite simply sampling bias. So unless the authors were unaware of this issue, which seems unlikely after decades studying the subject, it most inappropriate of them to have fitted a quadratic to the combined record in the first place and even more so to have featured that “acceleration” in the abstract. I don’t know if that explanation is sufficient Bill. Looking at your graph, even that group does not continue downwards. So unless those were records that ended circa 1860 there is still a change of direction that requires explanation. … But, the simple fact is, the PMSL database is a complete mess. Why do we only have 4 or 5 reconstructions of sea level from this huge database? Because it is a complete mess and it takes a huge amount of human effort in sorting and fixing just to put together a simple database of long-lived stations, or 400 stations, let alone 1207 stations. I’ve been doing climate database work for a long time and have learned a few shortcut methods that made it at least possible to get an average sea level out of the measurements. Beyond that, I think, you need 2 nerdy grad students with great computer skills working for a summer to put together a useable database. Between 1807 to 1857, the average of the gauges in the database fell by 100 mms. There seems to be some consistency in the type and number of tide gauges during this time. Did it really fall by that much or was it just subsidence. I think subsidence, Jevrejeva says it was partly real. She must have more nerdy grad students than I have. After that, a large number of other stations were added and it becomes nearly impossible to track what sea level was doing in my version of the PMSL database. The average went up by 200 mms between 1857 and 1868. This is obviously mostly station sampling. Rising measured sea level could be subsidence, not falling. If it’s PG rebound it should be constant. Very possible, But I don’t think it is scientifically “obvious”. It needs explaining . There was a large sampling change in this period of marked “acceleration”. The trouble is they all seem to change, so it’s not just new samples. Also as I noted above, GAIA adjustments also “accelerated” in this period. Clearly there are unresolved issues in the data and the adjustments so no one should be fitting quadratics to this nonsense and putting it in the abstract of the paper. I still think it’s good paper in general, very detailed. It will be good to get actual numbers to work on. I say that because maybe something did happen. There’s too much “correcting” data to fit preconceived expectations going on already, right across the whole field. A bias that large , if that’s what it is, must have a detectable cause. Anyone been to Bangkok recently? It should be underwater. It should be underwater? Under martial law perhaps. Funny how other catastrophic problems tend to come along much quicker than CGW. USA will be under martial law before LAX is underwater too. Your most likely correct though, that improvements could be made regarding data analysis tools. I’d also like to see more reconstructions. Perhaps something akin to BEST using kriging? Maybe Zeke could provide some pointers? Thanks AJ, lost track of the thread in the last few days, but it looks to me that you have the skills to do a proper analysis of the sea level data. What would be the most illuminating is the average increase/(decrease) in mms for each tide gauge, for each year, area-weighted. Then this average change by year can just be pinned to start at 6900 mms (in 1807 for example). Just add each year’s average increase in each tide gauge to 6900 (not the average of the tide gauges because we noted above that gauges coming into and then out of the database are distorting the numbers, we just want the change in each by year). One is going to find lots of annual variability but just having a long properly done time series will allow one to answer the questions about acceleration, whether the satellites are accurate. The skeptic community really needs this to be done because of the state of the PMSL database. We have to rely on these reconstructions and satellite measurements from climate scientists that have pressures on them to report results in a certain way. I just want an objective analysis done on sea level change because it is very important. I’ve made this request to about 3 other people which appeared to have the skills to do the job, but nothing has come out of it yet. Bill, the method you describe is similar to what I used. It was only for the NH after 1930 due to coverage issues. If you scroll down to the bottom, you’ll see my calculated results.